The latest edition of the emailed Royal Enfield Community Newsletter contains startlingly simple advice on troubleshooting the coming Electronic Fuel Injection (EFI) system for Royal Enfield motorcycles. In the newsletter, Kevin Mahoney of Classic Motorworks, the U.S. importer for Royal Enfield, takes all of the mystery out of the computerized system that threatens to haul our vintage motorcycles out of the 20th Century. If you haven't already signed up for this outstanding newsletter, with its news and tips, do so here. "EFI can be very intimidating to the uninitiated but I think I can tell you everything you need to know to take care of the system on your new EFI Royal Enfield in one short article.The EFI system replaces the carburetor and is actually a much simpler device. It consists of an injector unit, a throttle body, a computer, and several sensors. These sensors feed data to the computer and it, in turn, controls the precise air-fuel mixture. "EFI has been a turned into a big mystery by the industry when in fact it is much easier to diagnose and repair than a carburetor because it has so few moving parts it is so much more reliable. 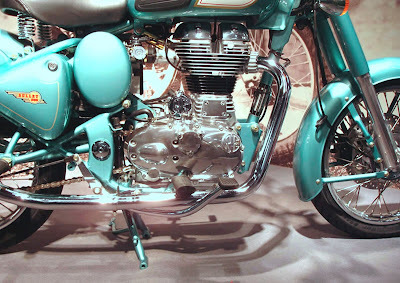 "Royal Enfield is also aware that many customers have long preferred to do their own repairs. For this reason, they insisted that a mere mortal with no special tools should be able to diagnose and repair this system. "The 'Check Engine' light will go on if something is not right. If that happens remove the seat. Find the wire that is attached to nothing. This wire comes from the EFI 'brain.' Touch that wire to the frame or any other ground. The check engine light will start to blink in a sequence of long and short blinks. For example, six short and six long. The sequence indicates which component is malfunctioning. Look in the shop manual to decode the sequence. "In the example of six short and six long blinks, the sequence indicates that the crank sensor is not working correctly. Check the wiring connection to that device. If this clears the blinking, you're done. If not, replace the sensor and then you're done. If more than one unit is bad, when you clear the first sequence another will start but that is very unusual. "This will take care of 98 per cent of all repairs on the EFI unit of the Royal Enfield. Now how simple was that?!"